When we got back to our hotel room we collapsed for the night and slept. We slept the sleep of the dead. Between our bodies still adjusting to European time and what we would soon learn was illness, the day’s tour proved utterly exhausting and our beds infinitely comforting. When the alarm went off the next morning Katie and I had a half-mumbled conversation where we unanimously agreed to keep sleeping and reschedule the tour for the next day. So for a few hours more the city of Dublin passed us by while we slept. It was only as we awoke that we discovered that our bodies had been at war during the night, that a vicious flu of sorts had laid siege and broken through our defenses. While my flu was bad, it was Katie’s which proved far worse. Bless Katie’s heart, she spent the vast majority of our time in Ireland, in the hotel resting. All of Tuesday was spent resting. We stayed in bed, watching TV and playing on our tablets or computers. Between my travel supply of Sudafed and rolls of toilet paper, we battled our stuffy noses. Eventually the the day was over and the sun had set, we curled up and passed out again. During the day I had called the tour company and gotten our tour rescheduled for the next day, hoping we would feel healthy enough to take it. Even though I was stuffy, I didn’t really feel sick. I didn’t have the aches, I wasn’t exhausted – so, when the time came to wake up for the tour, I did and determined I felt good enough to go. Reluctantly, I woke Katie up to see how she was. I knew what the answer would be, but I didn’t want to risk being wrong and have her feel up to the tour and miss it. As expected, she didn’t feel well, so she opted to rest. She was also extremely forceful in telling me that if I felt up to, I must take the tour and take lots of pictures to share with her. During the ride he asked where I was going and I told him that I was going to see the Giant’s Causeway. To which he told me how he had grown up in Dublin and had never been to Northern Ireland. Now, I need to admit something. Before this trip I had a very very scant understanding of the issues between Ireland and Northern Ireland. All I knew was that there was the IRA in the 80s. As far as I knew up to a week ago, the island of Ireland was entirely the same country. That is not true. Northern Ireland is technically part of the UK, they don’t use the Euro, they use the Pound Sterling. The political tension has eased a great deal in the recent decades but it’s clear that it’s an issue not too different from the old feelings which still pop up about the “South” versus America during our civil war. So, the cabbie pulls up to the Tourism office and again I’m early. This time though I’m so early there is literally no one else there. The cabbie is clearly questioning whether I’m in the right place, but I insist I am as I pay him. The truth is, I really considered climbing back into the cab and going back to the hotel. I’m tired, it’s cold, my nose is dripping, and as the minutes tick by with me sitting by myself on the stone steps I begin to worry. Did the tour company forget to tell me the pick up location had changed? Was the person on the phone wrong to tell me I was okay to come, was there actually no tour today? I did my best to control my anxiety as I waited. And for that I was rewarded as eventually people began showing up. Soon enough the bus pulled up and I hopped on board, finding a window seat and promptly passing out. Again we had a long day’s drive ahead of us as we crossed more of Ireland, this time heading north. Unlike Mike, Robbie was a man in his fifties and he was still fairly new to the tour bus driver business having done it for less than a year. He didn’t have the personality of Mike, instead opting for a more down-to-earth approach with a fairly constant patter of facts during the tour. After a gas station stop for breakfast (well, for me I stocked up on tissues, OJ, and a few snacks) we headed into Northern Ireland. The driver, Robbie, did a good job of setting the stage and explaining some of the political background to it all. Our next stop was a small fishing village on the northern coast. Here we were again just stretching our legs, but the stop was next to a nice little marina for a half-dozen boats as well as a pier. Since it was still early I got a few nice shots and this one is another of my favorites. From there we loaded up and our driver gave us the bad news. Part of today’s tour was supposed to be a rope bridge which had existed (and been updated) for hundreds of years to connect an island to Ireland. Unfortunately due to the day’s windy conditions it was closed so we weren’t going to be able to stop there. This time we stopped for lunch before the tour’s main attraction, lunch was again a fairly simple affair. We stopped at a restaurant which has to be almost wholly supported by tour groups, they had wifi and the food was good. 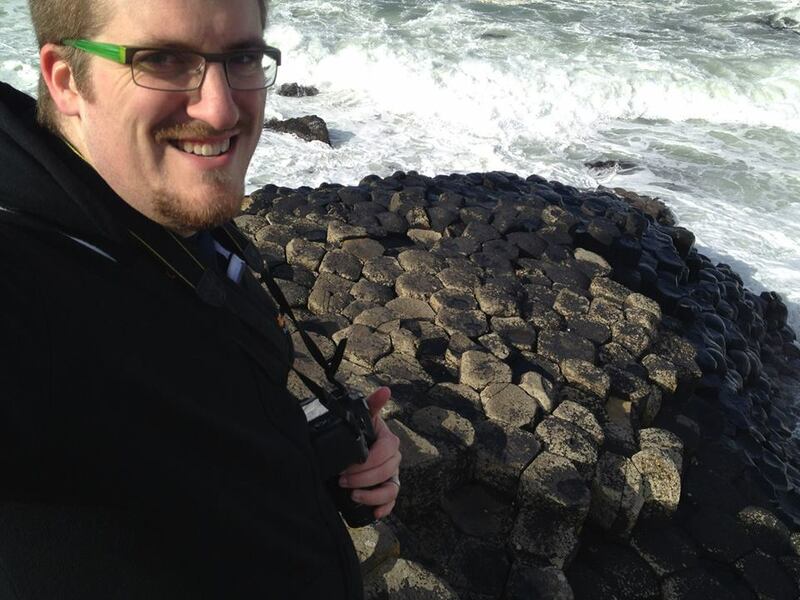 Next up, the main attraction: The Giant’s Causeway. 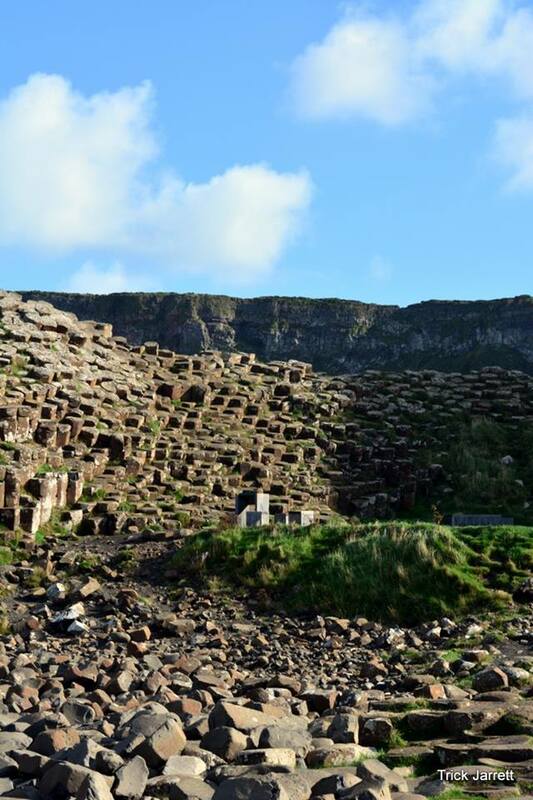 There’s a legend about the Giant’s Causeway as being the battleground between an Irish giant “Fionn mac Cumhaill.” He was also known as Finn MacCool, and he built the causeway as a place to battle a Scottish giant named Benandonner. When Benandonner came ashore, Finn ran and hid with his wife, having her dress him in baby clothes. 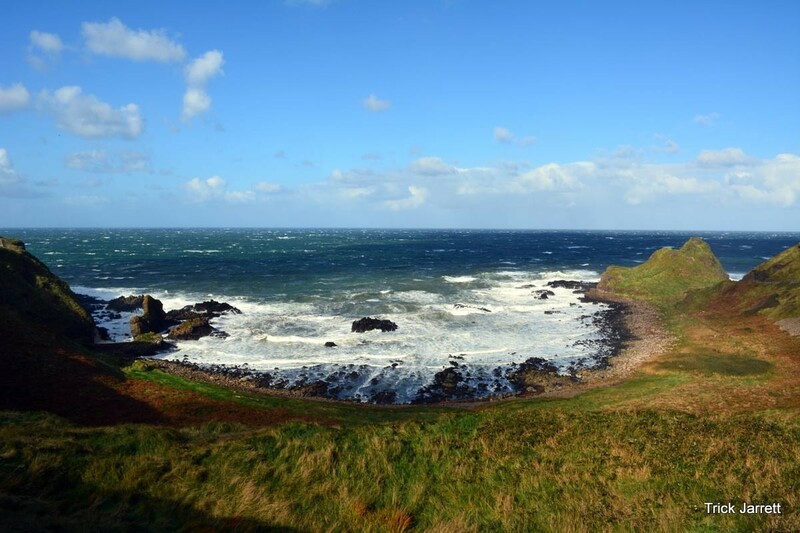 Benandonner came looking for him and he saw a giant in baby clothes and exclaimed “If that’s the baby, I’m not waiting to meet the father!” He ran off, destroying the causeway so that Finn could not easily pursue him. Standing among the stones, I don’t find this story hard to believe. 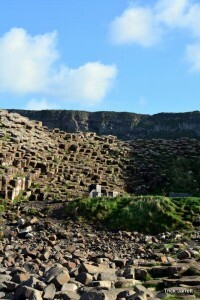 The stones seem otherworldly, formed by some alien or supernatural force, appearing as if they were formed on purpose into the hexagonal columns. The weather as I was there began to turn so I made the most of my time, snapping photos and hiking a bit past the main area to try and get some other shots. After getting as far as I dared I made my way back and sure enough as soon as I neared the bus pick-up the rains began sprinkling. I let the brief shower blow over and I huddled next to a rock formation to find this unique tradition: coins in the cracks. 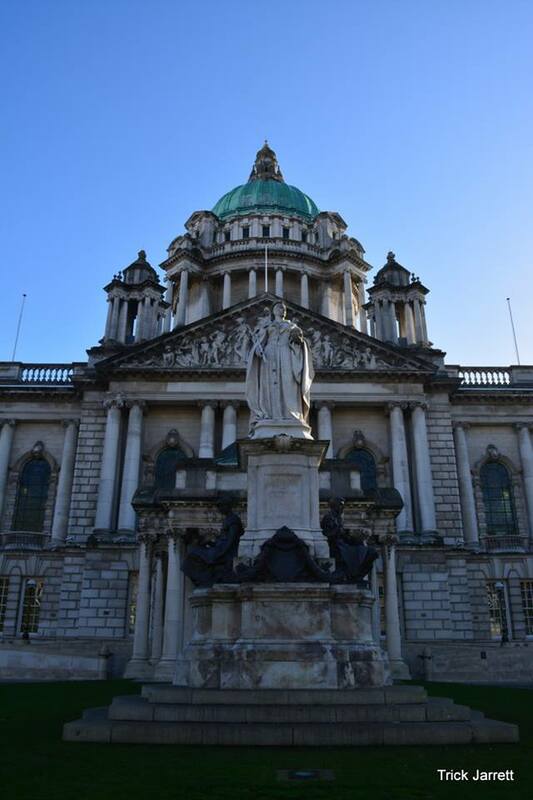 After re-boarding the bus there was only one more notable stop on our day’s tour and that is the capital of Northern Ireland: Belfast. I didn’t honestly see much of Belfast. I was tired and I wanted to ensure that I didn’t get lost in the foreign city so I hung close to the drop-off spot and snapped only a few photos of the capital before finding a coffee shop with wifi and hot chocolate to pass the time. I relaxed in the shop and enjoyed my warm drink as I surfed the web and posted on social media. Eventually the time came to return to the bus, and at that point I was exhausted and yet completely fulfilled. I had seen two life-goal destinations on this trip and it was time to turn my focus to work. I spent the bus ride home staring out the window and enjoying the landscape as we rolled back to Dublin from Belfast. This final post in the series is long overdue. For whatever reason I lost momentum in my posts and this one languished as a draft. 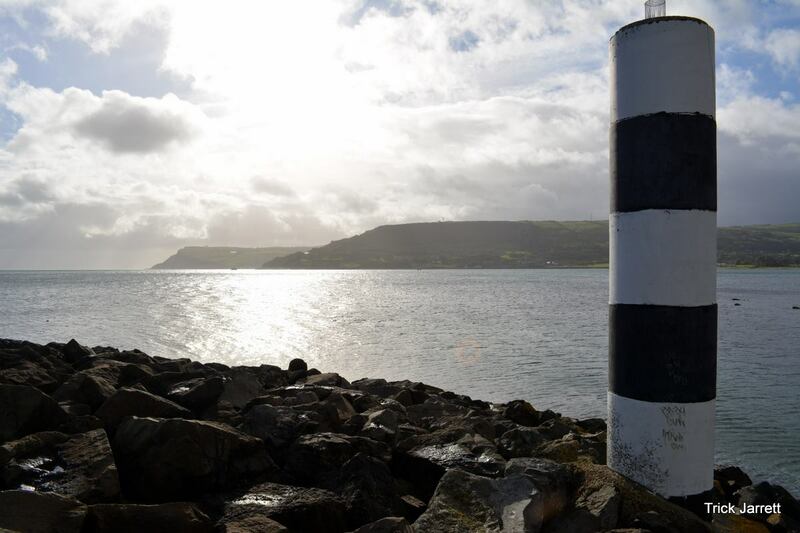 Ireland was a wonderful trip, and is a country I will eagerly look forward to visiting again and again.